This yearlong project involved a cross-cultural consideration of traditional Western and Chinese architecture (including history, cultural context, and technical aspects) along with the development of plans and materials in the context of a master-disciple relationship between 8 students and 6 professors. 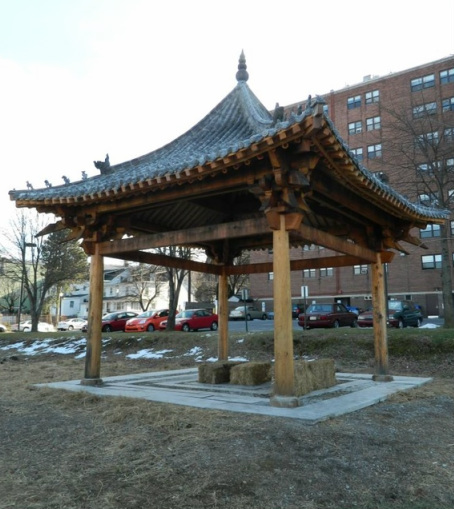 After traditional Chinese building and cultural studies, our student team developed blueprints, renderings, and construction management documents necessary to execute and construct the pavilion along the Bethlehem, PA Southside community Greenway. This project is supported by a grant from the Henry Luce foundation and is dedicated to promoting interdisciplinary and global education at Lehigh University. Above: A site poster translated into Spanish and Mandarin Chinese with precedent photos and an explanation of the history, purpose, and intention for constructing a pavilion in this location of the community. Right: A computer rendering of the site (pre-construction) utilizing SketchUp, Photoshop, and an original photograph. Above: Site after having been surveyed and leveled; SketchUp rendering of the pavilion skeleton and internal reinforcements of a corbelled bracket layering; Individual pieces that comprise of the Dougong corner ornamentation (see below). This structure is unique in that, like traditional Chinese structures, no nails or fasteners are utilized---the structure is secured by the precise weaving of its wooden members. 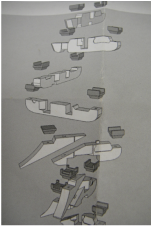 (Clockwise starting above left): An extrapolated rendering of the 20+ various pieces that comprise the traditional Chinese Dougong. [The Dougong is a unique structure of interlocking wooden brackets that fit strategically and precisely together (like a puzzle); serve as ornamental corner pieces in traditional Chinese architecture. (Right) Mid-assembly of a Dougong piece prior to its placement (left) between the 1st tier beams and purlin. Done with dowels. After our design and development phases in the fall, we jump started 2012 by biting the bullet of the cold weather and starting up construction. First, the site was surveyed and the dirt was laid and leveled, then we dug four 2.5ft by 4ft deep holes to insert the Sonotube and concrete a foundation underneath each of the four pillars. We spent all fall preparing and cutting the white oak slabs of lumber into exact shapes and sizes as dictated by our renderings for each structural section; we used wood shop tools including band saws, hand saws, lathes, draw knifes, and drills. Our team constructed a Jin-pole, which served as the pulley (or block and tackle) system for lifting beams and other heavy equipment on the site. The four photos below illustrate the progression of the construction phases. 1) Once the corner pillars were placed, we erected 2 horizontal beams by hand, and then used the jin-pole to secure the remaining 2 perpendicular members, which completed the 1st tier framing. 2) Next, we assembled the Dougong structures at each corner on top of the pillars--This was the most complex and time-consuming portion of construction, due to the precise placement of each piece in the Dougong. 3)The 2nd tier of beams were added next, followed by the purlins and rafters of the roof skeleton. Photo on the far right is the completion of the second phase. The four photos above illustrate the final phases of construction. Once the exterior portion of the roof framing was completed, sheathing and a layer of waterproofing tar paper was added on top of the rafters. In the final step, authentic Chinese clay tiles and ornaments were added to the roof; a row of small figres along the corner spine represents a marching procession of imperial hierarchy, which is common decoration in Chinese architecture. The heavy weight of the tiled roof weighs down on the inward stepping tiers, essentially securing the entire structure. Seen below is the completed project with an inner gravel border. During the spring of 2010, I contributed to the final construction phases of two residential homes in Monroe County of Bloomington, Indiana. Through effective project management and collaborative efforts with the Bloomington Habitat for Humanity staff, mastery of skills in soffiting, siding, roofing, and carpentry led to the successful completion of both homes.